MANHATTAN — On streets far below, business was spiraling down, but high above the city the “race to the sky” continued. 40 Wall Street topped out at 927 feet. The Chrysler Building soon topped that. Then in the spring of 1930, in Manhattan’s Midtown, men began climbing, building, soaring higher than in all of human history. Skyscrapers had been photographed for decades, always from the ground. But one photographer had the vision and the courage to shoot from the top. Millions of us have stood on the Empire State Building’s 86th floor deck. There the thought of stepping out, of climbing up sends ice water through us. Yet here is Skyboy, as Hine first named him, flying above the city on a single strand of cable. No one knows his name. Hine later called him Icarus after the Greek hero who fashioned feathered wings and flew. Hine’s photos of Icarus’ fellow laborers are identified only by their jobs. Plasterer, sheet metal worker, cement mason, bricklayer. . . Most were Irish or Italian immigrants. 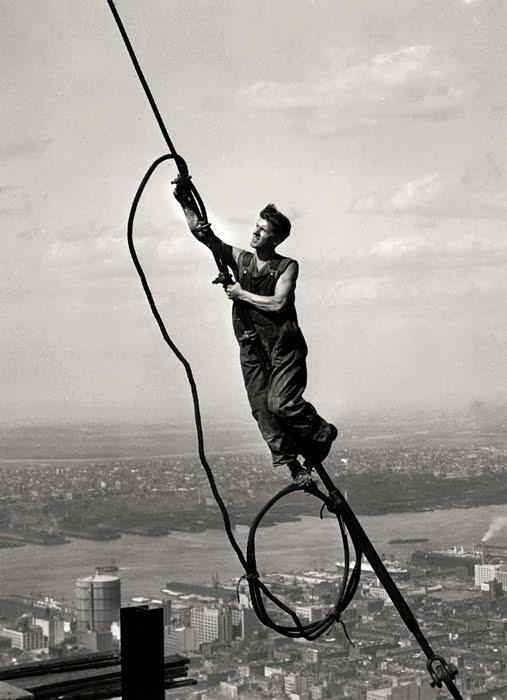 A few dozen were Mohawk ironworkers, famous for their indifference to heights. All, Hine knew, were heroes. Hine knew Labor because he had done it. When he was 18, his father died, sending Lewis to work in a furniture factory to support his mother and sisters. 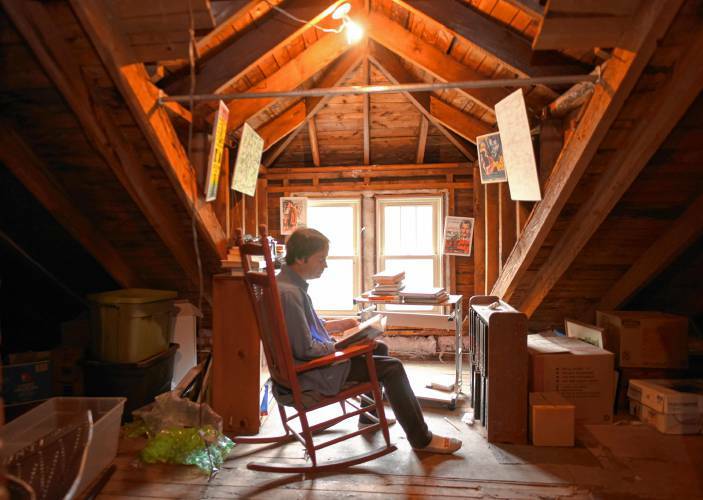 For the next decade, he toiled as a janitor, a wood cutter, a mailman. . . Going to night school, he finally became a teacher. Then in 1903, his principal needed a school photographer. Hine was soon toting a bulky camera, firing off flash powder, capturing light on glass negatives. Unlike Alfred Stieglitz or Edward Steichen, Hine never considered himself an artist. His was “detective work.” Two million children were toiling in America but industrialists denied sending anyone under 14 into factories, mines, and mills. Hired by the National Child Labor Committee, Hine posed as a Bible salesman, a business reporter, a fire inspector. And he caught images that indicted the nation. Girls stand before giant looms. Boys smudged by coal stare through Hine’s lens. Their faces are dulled beyond their 10 or 12 years. Each seems to ask how “the land of the free” can justify this robbery of innocence. Alarmed, Congress passed the first child labor law in 1916. The Supreme Court declared it unconstitutional. Hine kept shooting. Then in 1919, having “done my share of ‘negative,” Hine shifted focus. Hine had to work fast. From first beam to finished spire, the world’s tallest building was erected in 13 months. Some 4,000 men, framing four or more floors per week, sent the building skyward. The bookish photographer was with them all the way, on scaffolding and in spirit. “It isn’t really as dangerous as it looks,” workers told Hine. Others quipped, “it’s safer up here than it is down below.” Hine continued shooting, often from a open steel box hoisted by crane and dangled in the empty sky. 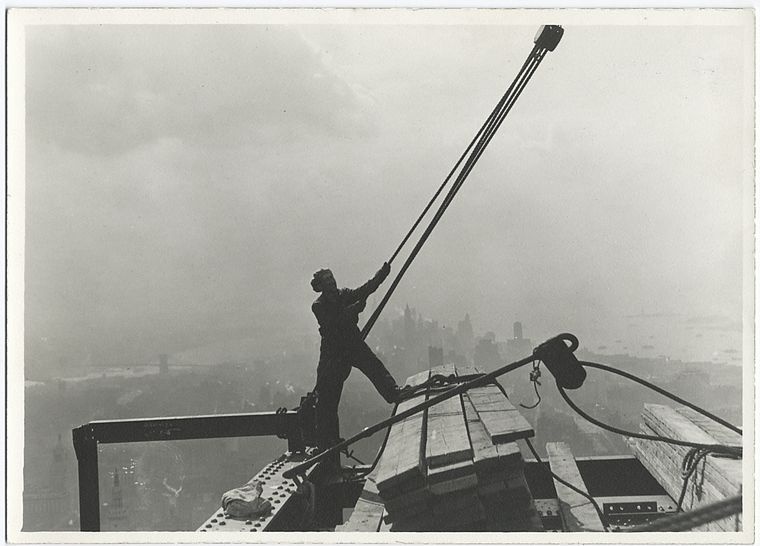 When the building was finished, he watched as workers hoisted an American flag 1,250 feet above Midtown. Hine died in 1940, nearly destitute. MoMA turned down his photos. It was only when the world of hard labor began to disappear people that saw what he had preserved — the dignity, the struggle, the honor of the people who built America. And in “Icarus,” he caught one such man, in one such moment, taking flight.